Casey’s stock a wide range of sealants and coatings. Please contact us if you need advice on the correct product for your job. FEB AQUASEAL BITUMEN ROOF REPAIR MASTIC is a trowel applied, black bitumen mastic, designed to retain its plasticity, and is suitable for overcoating with other Feb AQUASEAL Roofing products. FEB AQUASEAL BITUMEN ROOF REPAIR MASTIC is used to repair cracks and joints in roofs prior to application of the final waterproof coating, and for jointing metal gutters. All surfaces should be thoroughly cleaned to remove dust, dirt and other foreign matter which may affect adhesion. Wet surfaces should be brushed free from water and wiped with a dry cloth to remove any excess moisture which remains. Concrete, asbestos cement and other porous surfaces should be primed using FEB AQUASEAL FLASHING & ROOF PRIMER and allowed to dry. Apply FEB AQUASEAL BITUMEN ROOF REPAIR MASTIC by trowel so that it fills the imperfection and overlaps adjoining surfaces by 50mm (2?) to a thickness of 1.5mm (1/16?). For cracks exceeding 3mm (1?8?) in width lay a reinforcing strip of metal foil, canvas or thin roofing felt to cover the imperfection allowing a 400mm (1?) overlap, bed well in and cover the reinforcing strip with a further 1.5mm (1?16?) thick coat of FEB AQUASEAL BITUMEN ROOF REPAIR MASTIC. 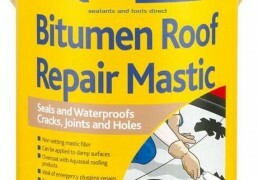 FEB AQUASEAL BITUMEN ROOF REPAIR MASTIC may be overcoated with other FEB AQUASEAL roofing products. Oil based paint should not be applied over FEB AQUASEAL BITUMEN ROOF REPAIR MASTIC as discolouration will result. (For Guidance Only) 0.7m per litre at 1.5mm thickness approx. depending on substrate. Tools should be cleaned with white spirit after use. 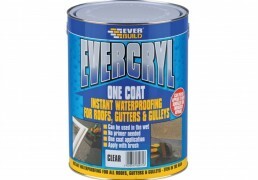 Evercryl is a resin based, fibre re-enforced roof repair compound which is effective on all common roofing surfaces, giving instant roof repairs even in the wet and on wet surfaces. May also be applied in frosty conditions down to -5°C. Evercryl is instantly waterproof when applied, there is no fear of wash off so emergency leaks can be tackled immediately as there is no need to wait for the rain to stop. Evercryl is brush applied and dries to a smooth seamless flexible membrane which resists algae and fungal growth. Because of the high level of fibre re-enforcement, Evercryl will bridge small cracks and requires only a one coat brush application to give instant and total water protection, even in areas subject to ponding. Evercryl requires no primer on sound non-porous surfaces. FEB AQUASEAL FIRMAFIX ROOF FELT ADHESIVE is used to bond roofing felt to roofing felt, concrete, asphalt, metal and similar surfaces. Note: It is not normal practice to stick felt to wood, it should be nailed. FEB AQUASEAL ROOF FELT ADHESIVE is used for sealing laps on felt. As a gritting adhesive, FEB AQUASEAL FIRMAFIX ROOF FELT ADHESIVE bonds roof chippings to roofing felt and mastic asphalt. The surface to which felt is to be fixed must have any moss and lichen removed, and the surface treated with a fungicide – which should be allowed to dry. All dust, dirt, grease and other material which may impair adhesion must be removed. Absorbent or dusty surfaces must be treated with a coat of FEB AQUASEAL FLASHING AND ROOF PRIMER at an approximate rate of 5.5m²/ltr. The general techniques of felt laying should be in accordance with BS Code of Practice 144 – Part 3, 1970. AS FELT ADHESIVE: Apply FEB AQUASEAL FIRMAFIX ROOF FELT ADHESIVE by brush or broom and when tacky (after approx. 15 minutes), roll roofing felt into position and press down firmly. When the adhesive is nearly dry (after approx. 6 hours) inspect the felt, any areas not adhering should be firmly pressed or rolled down. (Note: It is not advisable to stick rolling felt directly to timber. When fixing felt to boarded roofs, the first layer of felt should be nailed). AS LAP CEMENT: When nailing felt to wooden pitched roofs, it is essential to seal laps to ensure they are watertight. Working up the roof, position first sheet allowing a 40mm (11/2″) overlap to eaves and gables. Fix by nailing a 600mm (2ft) centres, 20mm (3/4″) in from top edge. Carefully bend felt over gables and eaves and fix by nailing at 50mm (2″) centres. Position second and successive sheets allowing a minimum 75mm (3″) overlap on lower sheets and fix in a similar way. Hold back lower edge, apply FEB AQUASEAL FIRMAFIX ROOF FELT ADHESIVE to lap and press back into position and nail at 50mm (2″) centres along the lap. AS GRITTING ADHESIVE: FEB AQUASEAL FIRMAFIX ROOF FELT ADHESIVE can be used for fixing grit or chippings over asphalt or roofing felt to provide a solar reflective coating. Surfaces must be sound and clean and the chippings dust free. Apply chippings within 30 minutes of applying this product. 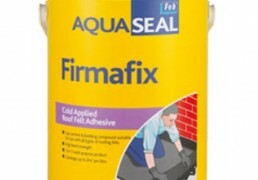 FEB AQUASEAL FIRMAFIX ROOF FELT ADHESIVE contains a solvent which can attack certain insulants. If its use is considered with materials other than roofing felts, or normal roofing products, please contact Technical Services. 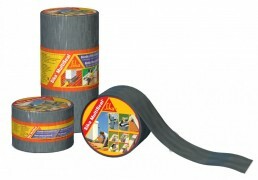 As a roofing felt adhesive/lap cement 1.5- 2.0m²/ltr. As a gritting adhesive 1m²/ltr for 3mm grit down to 0.75m²/ltr for 2mm grit. (0.7m²/ltr for 12mm chippings). Tools and equipment can be cleaned with white spirit or paraffin.